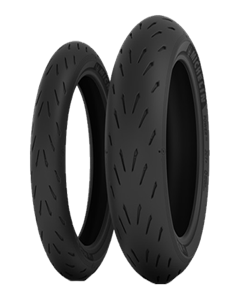 Unveiled at the "MICHELIN Australian Motorcycle Grand Prix"
The new MICHELIN Power RS tyre equipped the Safety Bike at the Australian Grand Prix and stands out as the new sport motorcycle road tyre benchmark. It is acclaimed for its sporty performance credentials and comfort. « The MICHELIN tyre pair impresses in all aspects of dry handling. Extremely light handling, brilliant steering precision in all types of bend and impeccable cornering stability all make the MICHELIN a winner - and not just in terms of points scored. With these tyres, the handling of the BMW is exquisite.